When were (Material) Safety Data Sheets "invented"? What agencies or regulations require us to keep SDS's? What organizations are exempt from OSHA's SDS regulations? What is the minimum amount of material that requires an SDS? What items do (or do not) require SDS's? How should we handle SDS requests for materials that do not require an SDS? Who do I have to give an SDS to and what is "downstream flow"? What are my rights to an SDS? 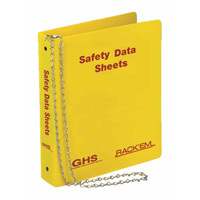 For a history of Safety Data Sheets (dating back to the ancient Egyptians! ), see Aaron Kaplan's presentation at http://jrm.phys.ksu.edu/Safety/kaplan.html. OSHA began requiring MSDS's for hazardous materials effective May 26, 1986 under 29 CFR 1910.1200, the OSHA Hazard Communication Standard. With the 2012 revision of the HCS, OSHA adopted the Globally Harmonized System and started phasing in SDS's from 2013 through 2016. 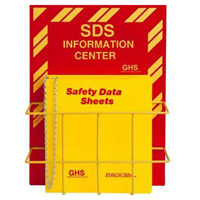 The differences between MSDS's and SDS's are discussed earlier in this FAQ. A comparison of the 1994 and 2012 HCS is also available which strikes out the old language in red, inserts new language in green, and has additional commentary on each section. The U.S. Government's Occupational Safety and Health Administration (OSHA) is responsible for the Hazard Communication Standard 29 CFR 1910.1200. The purpose of this standard is "to ensure that the hazards of all chemicals produced or imported are classified, and that information concerning the classified hazards is transmitted to employers and employees. The requirements of this section are intended to be consistent with the provisions of the United Nations Globally Harmonized System of Classification and Labeling of Chemicals (GHS), Revision 3. The transmittal of information is to be accomplished by means of comprehensive hazard communication programs, which are to include container labeling and other forms of warning, safety data sheets and employee training." The Hazard Communication Standard (HCS) specifies the required elements that must be on an SDS among other important data. It is a very readable document, and we suggest that anyone involved with SDS management print out a hard copy for future reference. Note that under the HCS, an SDS can contain more information than that required by OSHA, but not less. Other regulations address SDS's as well. For example, the U. S. Government's Environmental Protection Agency's (EPA) Community Right to Know Law (SARA Title III) is another set of regulations you'll want to consult. Any number of state and local regulations may (redundantly) require SDS's. Such regulations lie outside the scope of this FAQ. If you are uncertain as to which laws apply to you, contact both your state and federal EPA and OSHA compliance (not enforcement!) offices. Regulations similar to OSHA's are found in virtually every country, but these tend to vary slightly. Consult the GHS and International section of this FAQ for more information. Thus, the key consideration for public sector workers is federal OSHA versus state OSHA. When the federal Occupational Safety and Health Act of 1970 created OSHA, Section 18 allowed for states to come up with their own individual state plans. These state plans are monitored by federal OSHA and must at least meet the federal standards. Many go beyond the federal standards. There are currently 26 state plan states in addition to Puerto Rico and the US Virgin Islands. See http://www.osha.gov/dcsp/osp/index.html for more information on how state plans work and which ones have standards that differ from federal OSHA's as well as a state plan FAQ. Other states have adopted non-federally funded safety and health programs that cover their state or certain counties, cities or municipalities, so just because your state is not on the list mentioned above, it doesn't mean that OSHA regulations (or their equivalents) are not in place! In addition, state or local "Right-To-Know" laws may (or may not) include specific hazard communications type requirements (such as SDS). And, of course, SARA Title III also covers SDS's. Regardless of the state/federal coverage, your employer's insurance carrier may stipulate that your workplace meet OSHA standards even if they are not required to statute. And, of course, from a legal liability standpoint meeting (or exceeding) OSHA standards is probably a good idea. Bottom line: If you're not sure what laws are applicable in your situation, especially if you work for a public agency, contact your local OSHA compliance office; they might be able to direct you to appropriate agencies. The HazCom standard does not specify a minimum amount, for good reason. Some chemicals are exceedingly dangerous in even milligram quantities while others are not. There is no way that the Standard could anticipate and determine the potentially toxic effects of over 114,000,000 known chemical compounds (as of June 2016) and their mixtures. 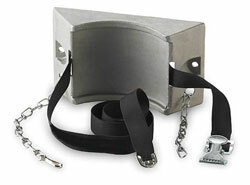 Safety Emporium carries all kinds of gas cylinder accessories to ensure you stay safe in the workplace. The only exception for this is when the material can release only a "very small quantities", i.e. a trace amount of hazardous chemical under normal conditions of use or a forseeable emergency. That does not mean a small amount. For example, in an OSHA Interpretation titled "Release of hazardous chemicals from gas calibration bottles", OSHA says that 2 ounces of ammonia requires an SDS. When trying to make a case for "trace amount", one has to consider if it is possible for an individual to be exposed to an amount of material that could cause harm. In the case above, an individual could conceivably release the contents of the cylinder into his/her face, causing harm. Likewise, the continuous release of just 25 ppm of hydrogen sulfide could cause serious harm! "The HCS addresses chemical hazards which are inherent properties of the hazardous chemical and would exist no matter what quantity was present in the workplace. Risk is a function of the inherent hazard and level of exposure. A substance either is or is not a hazardous chemical; the HCS definition cannot be read to indicate that a substance could be a hazardous chemical in some concentrations but not in others." To summarize, an SDS is required in almost every case unless there is essentially no way that the amount of material could cause harm. For additional information see this 1993 OSHA interpretation as well as this 2005 interpretation titled "Requirement to disclose all chemicals having scientific evidence that they pose a health risk regardless of concentrations present in the product on the MSDS." OSHA requires SDS's ONLY for materials that a) meet OSHA's definition of hazardous and b) are "known to be present in the workplace in such a manner that employees may be exposed under normal conditions of use or in a foreseeable emergency". An "article" means a manufactured item: (1) which is formed to a specific shape or design during manufacture (2) which has end use function(s) dependent in whole or in part upon its shape or design during end use; and (3) which does not release, or otherwise result in exposure to, a hazardous chemical under normal conditions of use. Any product which meets the definition of an "article," would be exempt from the requirements of the Standard. For example, a roll of copper electrical wire sold to a hardware store would fit this definition of an article and would not require an SDS. However, a load of copper ingots being shipped to a computer chip manufacturer would not meet the definition of an article and would require an SDS. Note that OSHA cannot make an across-the-board determination of a products' exclusion as an "article." The standard's definition by its very wording imposes the need to make case-by-case evaluations. Consequently, a blanket exemption for specific products cannot be given by OSHA. Definition of an "article" under the hazard communication standard (Jan 27, 1993). MSDS and labeling requirements for copper or aluminum wire or metal products (Mar 11, 1986). High speed cobalt steel drill bits evaluated as a "article" under the Hazard Communication Standard (Oct 2, 1996). See also a discussion of articles in Appendix A of CPL 2-2.38D - Inspection Procedures for the Hazard Communication Standard. Food and food products are...not totally exempt from coverage under the provisions of the HCS. Exempt items generally include food or alcoholic beverages which are sold, used, or prepared in a retail establishment (such as a grocery store, restaurant, or drinking place), and foods intended for personal consumption by employees while in the workplace. HOWEVER: if, under normal conditions of use, [the] product could result in a hazardous exposure situation for downstream employees who will be working with or otherwise handling that product then an SDS is required. For example, flour dust poses an explosion hazard and would require an SDS. The HCS does not apply to food items in a retail establishment (Apr 7, 1998). The hazard communication standard requirements for food or food additives (Jan 24, 1990). Cosmetics which are packaged for sale to consumers in a retail establishment, and cosmetics intended for personal consumption by employees while in the workplace are generally exempt. Therefore, your supermarket doesn't need SDS's if they sell prepackaged cosmetics, but your local beauty salon (which uses these occupationally) or a cosmetic manufacturing plant would require SDS's. Note: The US Food and Drug Administration (FDA) has very little oversight over cosmetics. See FDA Authority Over Cosmetics: How Cosmetics Are Not FDA-Approved, but Are FDA-Regulated at the US FDA. Also see this New York Times article from August 7, 2017, For Cosmetics, Let the Buyer Beware. MSDS requirement for occupational use of cosmetic Gentian Violet (Mar 7, 2007). 29 CFR 1910.1200 as it applies to beauty salons (Mar 13, 1990). Application of the Hazard Communication Standard (HCS) to Independent beauty salon Contractors (Feb 14, 1990). Drugs regulated by the U.S. Food and Drug Administration (FDA) are covered by the HCS. However, section (b)(6)(vii) of the HCS exempts FDA drugs when in solid final form, such as tablets or pills, for direct administration to the patient. Examples of those needing SDS's for drugs would include pill manufacturing facilities and pharmacies (if the drug is compounded, crushed etc.). Note: Remember that SDS's are not meant for consumers. Given the likelihood of patient confusion, most drug companies do not make their SDS's freely available to the general public. SDS's for drugs are the most difficult to find on the Internet and usually require direct contact with the manufacturer. MSDS's must be provided to employees who package/process drugs for distribution into final form if they contain hazardous chemicals. (Feb 8, 2005). The Occupational Safety and Health Administration's (OSHA) Hazard Communication Standard as they apply to veterinary drugs. (Dec 22, 1999). MSDS requirements for drugs (Oct 13, 1993). FDA regulated drugs that pose a hazard would be covered by the HCS (Sep 13, 1993). Hazardous substances found in veterinary practices (May 5, 1993). Requirement to develop MSDSs for pharmaceutical products and controlled substances (Sep 9, 1991). Hospital technicians required to attend HCS training and a clarification of coverage of pharmaceuticals under the HCS (Sep 9, 1991). Tip: Be certain that you properly label and account for your waste materials. For example, a bottle labeled "Used paint thinner" would still require an SDS, but once you call it "Hazardous Waste" it Officially becomes waste and subject to waste regulations such as the RCRA. Exemption of hazardous waste samples sent to a laboratory for analysis from the Hazard Communication Standard (Oct 17, 1998). Clarification of the requirements of the Hazardous Waste Operations and Emergency Response [HAZWOPER] Standard (Oct 31, 1997). Training required for clean-up of hazardous waste and hazardous substances (Jun 10, 1991). The HazCom standard does not apply to tobacco and tobacco products. Therefore, these do not generally require SDS's. We have no further information concerning the HazCom standard and tobacco. Please contact us if you can enlighten us. Hardwood dusts pose a carcinogenic hazard. Likewise, wood preservatives such as chromium copper arsenate (CCA) also pose hazards. In each case, an SDS is required. For comprehensive information about wood dusts in the workplace, see OSHA's Wood Dust Information Page. Clarification of OSHA's Hazard Communication Standard with regards to the carcinogenicity of wood dust (Oct 11, 1995). OSHA's hazard communication requirements for the wood products you sell (Dec 5, 1994). Review and comment on generic labels and consumer information sheets for chromated copper arsenate (CCA) pressure-treated lumber (August 31, 1994). Interpretation for treated wood products in regards to paragraphs (f)(2)(i)-(iii) of the HCS (Nov 17, 1994). Coverage of wood dust under the Hazard Communication Standard (HCS) (Dec 7, 1987). The HCS exempts any consumer product or hazardous substance, as those terms are defined in the Consumer Product Safety Act (15 U.S.C. 2051 et seq.) and Federal Hazardous Substances Act (15 U.S.C. 1261 et seq.) respectively, where the employer can show that it is used in the workplace for the purpose intended by the chemical manufacturer or importer of the product, and the use results in a duration and frequency of exposure which is not greater than the range of exposures that could reasonably be experienced by consumers when used for the purpose intended. For example, if one uses window cleaner in the workplace to occasionally clean a window then the employer is not required to keep an SDS on this material. However, if it is the employee's duty to clean windows all day long in an occupational fashion then an SDS would be required. It is the employer's responsibility to establish that the frequency is equivalent to typical consumer use. OSHA inspectors will question your employees to verify this claim, so do not be deceptive; the penalties for such willful violations are significant. Hazard Communication: classification of uninterruptible power source batteries and office chemicals as "consumer products". (Jul 8, 2004). Consumer Products that Contain Hazardous Chemicals (May 28, 1996). Hazard Communication and Consumer Products (Aug 15, 1991). Employee exposure to consumer products (Nov 27, 1990). Provision of MSDSs for consumer products used in the workplace (Jan 9, 1990). The HCS specifically exempts nuisance particulates where the chemical manufacturer or importer can establish that they do not pose any physical or health hazard covered under this section. Of course, this is rather redundant. Anything lacking physical and health hazards is not hazardous and, therefore, does not require an SDS. Note: many dusts, including flour and hardwood dusts, have physical and/or health hazards and would require an SDS. Manufacturers of nuisance particulate are still required to perform a hazard evaluation and determine whether or not their products present any of the specific hazards covered by the HCS. OSHA has reason to believe that a number of these particulate do present physical hazards, such as the potential for fire and explosion, and others may have some health effect, such as irritation. For example, according to a Bureau of mines report entitled, The Explosibility of Agricultural Dust, corn starch and powdered sugar are considered to be "strong" explosion hazards. Applicability of the requirements of the Hazard Communication Standard to rubber dust byproduct sold by tire recapping company (October 15, 1991). Application of the Hazard Communication standard to a nuisance particulate (Jan 16, 1986). Also see the interpretations listed under wood dusts, above. Radioactive materials are exempt from coverage under the HCS if the only hazard they pose is radiological. However, if the material also possesses physical or health hazard, then an SDS is required. See Occupational safety and health guideline for uranium and insoluble compounds, for example. Radiological hazards are addressed in at least partial fashion in the Hazardous Waste Operations and Emergency Response Standard (HAZWOPER, 29 CFR 1910.120), the Bloodborne Pathogens Standard (29 CFR 1910.1030) and the Respiratory Protection Standard (29 CF 1910.134) (and possibly others). Biological hazards (biohazards, biohazardous materials) are exempt from coverage under the HCS if the only hazard they pose is biological. However, if the material also possesses physical or health hazard, then an SDS is required. Examples of biohazards include microbes, anthrax, vaccines, and cell cultures. Note: Biological hazards are addressed in at least partial fashion in the Hazardous Waste Operations and Emergency Response Standard (HAZWOPER, 29 CFR 1910.120), the Bloodborne Pathogens Standard (29 CFR 1910.1030) and the Respiratory Protection Standard (29 CF 1910.134) (and possibly others). Most frequently asked questions concerning the bloodborne pathogens standard (Feb 1, 1993). According to the first OSHA interpretation listed below, "...clerical workers...may not be subject to the requirements of the HCS. Office workers who encounter hazardous chemicals only in isolated instances are not covered by the rule. The Occupational Safety and Health Administration (OSHA) considers most office products (such as pens, pencils, adhesive tape) to be exempt under the provisions of the rule, either as articles or as consumer products. For example,...[consider]...copier toner. OSHA has previously stated that intermittent or occasional use of a copying machine does not result in coverage under the rule. However, if an employee handles the chemicals to service the machine, or operates it for long periods of time, then the program would have to be applied." For example, if an employee uses a solvent to clean a typewriter once a year, that situation does not require an SDS. But if the employee cleans typewriters every day as a repair person, then an SDS is required. Applicability of the HCS to office workers and copy machine operators (Mar 31, 1989). Application of the Hazard Communication Standard to art materials industry (Sep 17, 1987). There will likely be occasions when someone will ask for an SDS when one is not required or demand a written statement that no SDS is required. See How should we handle SDS requests for materials that do not require an SDS? for further information. As discussed above, items that are not hazardous or that are specifically exempted in the OSHA HazCom Standard 29 CFR 1910.1200 do not require an SDS. Section G.2 of the OSHA Inspection Procedures for the HazCom Standard explicitly states the standard requires SDSs only for hazardous chemicals. The HCS does not require manufacturers, or importers to supply SDSs for non-hazardous chemicals. Nonetheless, some downstream clients may still insist on an SDS in cases where one is not required. If you encounter someone who will not accept a verbal assurance, OSHA has suggested providing a written statement such as "This product is not considered to be or to contain hazardous chemicals based on evaluations made by our company under the OSHA Hazard Communication Standard, 29 CFR 1910.1200." This gives the requesting party something that they can put in their files and saves the manufacturer from needless work. For items that are specifically exempted from coverage under the Standard, your statement should reflect the specific exemption(s) and the specific paragraph(s) of the standard which applies. On the other hand, you may receive an SDS for something that is truly not hazardous. For example, Amerex has an SDS for deionized water used in water mist fire extinguishers. According to the OSHA Inspection Procedures for the HazCom Standard section G.4.b, if an SDS is provided for a non-hazardous material, the receiving party is not required under HCS to maintain that SDS.. However, your attorney may advise you to keep it anyway just to be sure. For more information see this OSHA interpretation letter titled Application of the Hazard Communication Standard to art materials industry. As mentioned previously and discussed below, manufacturers and distributors are under no OSHA obligation to supply SDS's to consumers. We encourage manufacturers to make SDS's freely available to everyone, but suggest that the sheets carry a notice explaining that SDS's are meant for occupational use, not consumer use. Note: While this flow diagram indicates "Employer C", an upstream supplier might ship a material to more than one physical location for a particular downstream employer. In such cases, the SDS must be sent to each location where the material is used, not simply the employer's main office. See Responsibility of chemical manufacturers and importers to provide MSDSs to one or more establishments owned and managed by same employer. 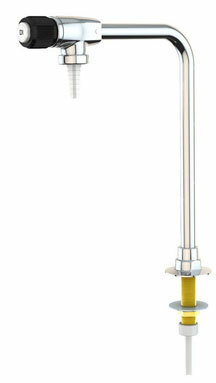 Let your water flow with pure water valves and faucets from Safety Emporium. However, because this chain of information transmission through the distributor can sometimes be broken, OSHA has added the requirement that manufacturers must provide a copy of the MSDS to other "downstream" employers upon request. Your "FAX-on-demand" system can be used to fulfill this requirement. Please refer to revised language in paragraphs (g)(6) and (g)(7) of the standard for additional clarification on requirements for providing MSDSs. In general, if you need an SDS, you should get it from your "upstream" supplier. If that is not possible, then the manufacturer must supply one on request (as long as you are an employer that requires an SDS under the Hazard Communication Standard). See also: Manufacturer and employer responsibilities when providing MSDSs electronically for more on downstream flow and manufacturer responsibilities. Consumers: As stated previously, many manufacturers or distributors are happy to give an SDS to anyone who asks but they are under no OSHA obligation to distribute these to consumers. See this OSHA interpretation letter and the downstream flow entry above for more information about how SDS's are supposed to be distributed. Dozens of homeowners have asked us about demanding/requesting SDS's from contractors whose work they believe has caused them harm - for example, fumes, odors and/or illnesses from newly installed carpet, flooring, sealants etc. Although most contractors will gladly provide an SDS, they are under no regulatory obligation to do so. If you are certain that the material meets the OSHA definition of hazardous then the contractor is required to have an SDS for his employee's use. If not, he is in violation of OSHA regulations. Just the threat of reporting the contractor to OSHA for willful non-compliance is probably enough to change his mind. Alternatively, a letter from an attorney might work, too. If you have no luck with the contractor, try the original manufacturer's web site or toll-free number. But if you want to know for certain whether there are potentially hazardous fumes in your house, have the air professionally tested. Look under "Laboratories, Analytical" or "Laboratories, Testing" in your local yellow pages. If you are intent on having copies of SDS's for all hazardous chemicals used during a home repair project, you should list this as an explicit requirement in the written contract. Of course, SDS's aren't meant for consumers, but they seem to give some folks a peace of mind. What about those signs you see in home improvement stores about SDS's being available on request? Yes, SDS's are available there, but under the "downstream flow" concept and as discussed in paragraph (g)(7) of 29 CFR 1910.1200, the Hazard Communication Standard, the store is only obligated to give them to customers who are employers. Therefore, a consumer who asks may or may not get one, but there is no harm in asking! Employees. Employees must have "ready access" to SDS's while they are in their workplace. There can be no barriers to access - you should not have to fetch a key, ask a supervisor, submit a request etc. SDS's must be on hand for every hazardous chemical "known to be present in the workplace in such a manner that employees may be exposed under normal conditions of use or in a foreseeable emergency." There are some exceptions to this rule, of course. Contractors. See What requirements are there for contractors or multi-employer sites?. Former employees. Under the OSHA standard 29 CFR 1910.1020, Access to Employee Exposure and Medical Records, your employer is required to keep a record of your exposure to hazardous materials at work. These "employee exposure records" are to be kept at least 30 years after you terminate employment. 1910.1020 allows employers to use SDS's as part of or in lieu of other sorts of documentation. As described in the previous hyperlink, you or your designated representative (union rep, attorney etc.) have a right to see your records at no cost and to obtain copies. See also our FAQ entry Can I throw away old or outdated SDS's? Notice: This page is copyright 1998-2019 by ILPI and was last updated Tuesday, August 8, 2017. Unauthorized duplication or posting on other web sites is expressly prohibited. Disclaimer: The information contained herein is believed to be true and accurate, however ILPI makes no guarantees concerning the veracity of any statement. Use of any information on this page is at the reader's own risk. ILPI strongly encourages the reader to consult the appropriate local, state and federal agencies concerning the matters discussed herein.